HoneyDo's Handyman Blog - Fleet, Hampshire. HoneyDo’s Handyman Service is a Local Fleet Business Network With Us! 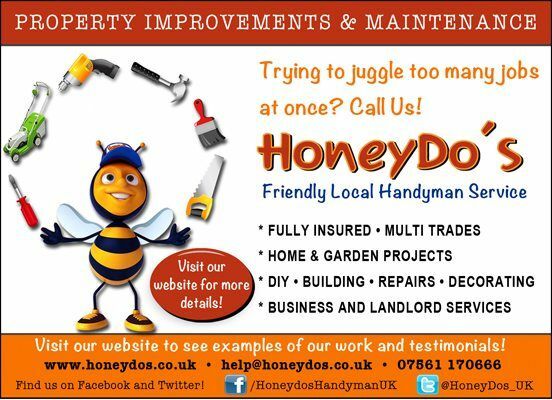 HoneyDo’s Handyman Service is a local Fleet Business, network with us by using links on the right hand side of this page to connect with us! In today’s online world, social media has enabled us to communicate with customers like never before, allowing us to offer you a level of service and ease of use that would never have previously been possible. Whether your preference is for Facebook, Google, Twitter, or something else entirely, we have done our very best to maintain a presence on all of the popular sites, especially in the local Fleet business network, allowing you to contact and communicate with us 24/7 at your convenience. These informal methods of contact make life easier for you and match perfectly with our local friendly service ethos, taking the hard, cold edge out of business and giving it a friendly, personable face! HoneyDo’s Handyman Service offers a whole host of multi trade services and can tackle a multitude of jobs around your home, garden and business. From decorating, gardening and home improvements to odd jobs, loft boarding, fencing and so much more, we can take the struggle out of your life and provide a quick, efficient way of making life easier for you. Our rates are very competitive and we have had wonderful feedback from our customers, which you are able to view on the website (just click the ‘Feedback & Testimonials’ orange box at the top of the page! ), along with images of the work we have done. Don’t hire ten different tradesman, just take a look around our site, get a feel for our work and once you are comfortable and would like to make an enquiry, just pop on over to our easy to use contact form. We do appreciate your business and strongly believe that customer service is something that should not be forgotten, so give us a try…you’ll see we really are a genuinely friendly, local handyman service! Painter & Decorator, Fleet Hants. Painting and Decorating. Looking for Painters & Decorators in Fleet Hampshire? As the weather continues to tease us with an occasional glimpse of sun, the requests for garden maintenance jobs, gardening, fencing, fence painting and decking are starting to come in thick and fast. But, not only do people want to freshen up the outside of their houses, they also want to give the inside a bit of a boost and painting & decorating is the obvious way to do it. HoneyDo’s Handyman Service offers a whole range of painting & decorating in Fleet Hampshire & local areas. Whether you would like your walls freshened up, your old woodwork filled and glossed, your ceilings made to look new again or anything else in your home, we can do it for you. We also offer a tiling service so if you are looking to have your kitchen tiled or your bathroom tiled, or are interested in floor tiling or wall tiling, you’ve come to the right place! One of the most common complaints I hear from people is that there is just never enough time to get jobs round the house done, believe me it’s no different in my house! The answer is easy, unless you’re happy to spend all your free time doing chores and decorating, it makes sense to hire someone to do your painting & decorating for you – after all, you deserve some time to relax too! Maybe your house is in need of some repairs before you can even consider decorating? That’s no problem at all – in fact one of the beauties of hiring a handyman is that you can get repairs and decorating all done in one go without the need to spend extra time and money hiring a multitude of tradesmen and arranging endless appointments to get everything done. I’m still working hard on adding examples of my work onto the website and will continue to do so as I gradually find images from older jobs and add new ones too! So if you are interested in hiring a painter & decorator or handyman in Fleet Hampshire (and local areas), give us a shout! Of course interior painting & decorating is something we’re all familiar with but remember, painters and decorators can also offer exterior improvements too! We offer shed painting, decking painting & staining and we can even paint the outside of your house or business for you! Painting can give a new lease of life to both your indoor and outdoor life, so don’t put it off, get rid of those tired old surfaces and make things feel fresh again! If you would like a free quote for your painting & decorating work, contact HoneyDo’s Handyman Service. We are based in Fleet Hampshire and cover all local areas in Hampshire and Surrey including: Aldershot, Farnborough, Camberley, Farnham, Blackwater, Ash, Cove, Church Crookham and more! Hello again and welcome to another blog post by HoneyDo’s Handyman Service. Remember, we are based in Fleet and our Handyman Hampshire service covers all local areas! I recently completed a loft project for a customer and thought it would make an interesting subject for a blog post. Loft’s are funny things and are often overlooked when it comes to property maintenance, which doesn’t make sense really, as they are potentially one of the most important rooms in your house. Just consider for a moment the humble loft, most people never venture up there, it can be a dark, unwelcoming area of your property that you are unwilling or unable to access and is often full of junk from Christmas’s long past..things that you will never use again and honestly probably don’t even realise is there. Now consider what your loft could add to your home and the options you have for it. Of course you could go all out and choose a loft conversion; the success of this will vary from loft to loft, but if done correctly you could simply add another room to your house, an invaluable option in today’s market where everyone is trying to make the most out of their current property. However, loft conversions can be expensive and may be a little too much for your pocket too handle, in which case why not consider another option. We all know the value of loft insulation but is your loft insulated? With the weather we’ve been having lately this is a particularly relevant topic as a badly insulated loft can cause you to lose precious heat and often suffer freezing draughts in your home, something none of us want! HoneyDo’s Handyman Hampshire & Surrey can insulate your loft for you, giving a quick and effective option to warm your house. If you’d like a free quote just Contact HoneyDo’s Handyman Service. If you’d like to take this a step further, take a moment to consider having your loft boarded. No more tiptoeing gingerly from beam to beam, fearful that a misplaced foot will end up poking through the downstairs ceiling, a properly boarded loft will widen your storage options considerably, giving you the space and flexibility to safely and securely access your homes space. No more throwing boxes into a void and hoping you never have to deal with them again, loft boarding will make it easy to move around and store items to your hearts content! Of course now you have your wonderfully handy boarded loft, it’s not much good if you need an enormous ladder, or a bunk up by your other half to access it. If that’s the case in your household, then having a loft ladder installed has to be the next item on your to do list! Loft ladders increase accessibility and give you a safe and easy way to enter and exit your brand new storage area. Installing loft ladders is a service our Handyman Service offers, so if you’d like to make your life easier and are considering getting a loft ladder installed, give us a shout!. To view images and examples of loft boarding, loft ladders and other loft projects: Click Here. If you are interested in a free quote for your loft work, contact HoneyDo’s Handyman Service. We are based in Fleet Hampshire and cover all local areas in Hampshire and Surrey including: Aldershot, Farnborough, Camberley, Farnham and more! Comments Off on Hampshire Handyman! Nothing and no one can dictate how you want your home to look, in fact the current trends for handyman work encompass both interior and exterior work as well as general property maintenance. Inside your home, the most dramatic way to get an instant makeover is to decorate; paint those tired old walls, give that skirting board a fresh coat of gloss and pay attention to those hard-working doors. Small repairs such as cracks and holes can often bring the appearance of a room right down so make sure you get those seem to before they get any worse and think about adding some colour to your home. Maybe vibrant citrus colours aren’t your thing but even a hint of colour can add warmth and personality to your rooms, making it feel like an entirely different house! Of course there is no reason why you can’t pay exactly the same attention to the exterior of your property. Decking, patios, driveways and pathways can suffer badly in the winter months, with a build-up of unsightly dirt and grime which makes your garden look dull and lifeless as well as slippery and dangerous. Pressure washing/Jet washing is the answer to this, enabling that nasty surface layer to be cleaned and removed, leaving behind a lovely fresh surface to give your garden a boost. Many people are stunned at how their old patios and driveways, suddenly look bright and fresh again, giving the appearance of a brand new surface, at a very reasonable price. *Click here to see the difference Pressure Washing can make to your surfaces! Painting and decorating is another area where the outside of your property is also often overlooked. Just as the walls inside your house suffer the strains of everyday life, so do the walls outside…in fact even more so. There is such a huge range of exterior paints and stains available nowadays that the your imagination really is your only limit, allowing you to turn those sheds, fences, decking and exterior walls into an attractive and welcoming feature. Never underestimate the importance of doing this as it really will allow your outdoor living experience to be a much more enjoyable one..and let’s face it, we have to enjoy the nice weather on the few occasions that we are lucky enough to get it, so the sooner those handyman jobs are tackled, the sooner you can get out there! But maybe your decking, fencing and patios are in need of a little bit more than just a freshen up. Over time, the elements take their effect and you might find that you’d like to start over again with a new design or replacement garden surface. To enable you to really get the most of your garden, ask yourself the question, what do YOU want from it? As obvious as that may sound, people often fail to recognise their own needs in outside living and so are unhappy with their choices in the long-term. Do you enjoy gardening and garden maintenance? do you love entertaining? or do you prefer to stay indoors and look out? maybe you hate getting your hands dirty and would like to just see a nice, clean usable surface? whatever your needs HoneyDo’s Handyman Service can help you. We can discuss your own personal needs with you and make a decision that will last you for many years to come! Whether you require new fencing, decking or a brand new patio, or whether you simply want to give your home a new lease of life by pressure washing and decorating, our Surrey & Hampshire Handyman Service can help you. Don’t put it off, get those jobs done before the sun shines! To contact HoneyDo’s Handyman Service, please click Here and fill in our easy, online contact form! Fleet Handyman For Hire in Hampshire! Comments Off on Fleet Handyman For Hire in Hampshire! So here we are again with a brand new handyman blog post on a brand new website! Sadly this is mainly due to the site being hacked, which caused us to lose all previous content, but hopefully this time round we’ll be even bigger and better than before! HoneyDo’s is a local handyman business. We are based in Fleet, Hampshire and cover all local areas. We pride ourselves on offering a reliable friendly service, with a big dose of good old-fashioned customer service! The majority of our business is based on word-of-mouth, which we think goes a long way to proving we maintain a very happy and satisfied customer base. At the end of the day, we aren’t happy unless you are! Our service can save you a fortune when it comes to employing people to work on your home or business, after all, why employ 5 tradesmen when you can hire us to do it all! If you would like to get an idea of the kind of work we offer, please see our List of Services…and if you don’t see your job on there, just ask! We cover all kinds of jobs from the smallest garden clean-up to the largest renovation and have substantial experience in all areas of work…keep an eye on our new Gallery section where we will soon be adding photos of what we do! Many of our customers have been kind enough to send us some glowing testimonials, which we have added to the bottom of the front page – please take a look at these and feel free to friend our Facebook account, where you will see screenshots from a lot of them, we don’t believe in making up false feedback – you will only see genuine feedback from genuine customers on our pages! Local areas covered include: Aldershot, Alton Bagshot, Basingstoke, Blackwater, Bracknell, Camberley, Church Crookham, Cove, Dogmersfield, Farnborough, Farnham, Fleet, Hartley Wintney, Hook, Lightwater, Odiham, Yately. This is by no means a complete list, so if your town isn’t listed on here, please Contact Us. All feedback is welcomed from customers – our Facebook account is the fastest way to guarantee a response but you can also use our Contact Form, email us directly on help@honeydos.co.uk or ring us on 07561 170666 – either way, we are always glad to hear from you!